Don’t take our word for it—hear what other happy families have to say about Music Together with Alexia music classes for kids! "My 3.5 year old and I love this class. I've seen him really blossom under Alexia's patience and expertise. I highly recommend this class!" "Alexia is a wonderful singer, instrumentalist, and teacher who is as good at managing behavior and providing a calm environment for children as she is at delighting them with her music and sense of humor." "How fortunate we were to find the Music Together® program. We started our son when he was just a few months old. Now he's over two and we have completed six terms so far. The music is unique, thoughtful and fun. The class has so much variety and is perfectly paced. The kids can interact with each other and with parents. They get to free dance, improvise with instruments of their choosing and they learn to communicate musically. Our experience has been extra special for one reason. We took all of our sessions with Alexia. Her love of the program and sincerity came through every note, every week. She is caring, kind and patient with the kids and a truly gifted vocalist. Alexia plays a mean ukulele as well. As new parents, my wife and I are already seeing the importance of influential teachers in our son's life. If you have the chance to take Alexia's class, don't hesitate. I can't say enough about her and the Music Together experience overall. "Hello Everybody" will be with us for many years to come." "Such a wonderful way to be musical with your child! Both my daughter and I love Alexia's classes!" "It's been such a great experience seeing our two children grow through Alexia's classes during the past three years. Alexia is a stellar teacher. She is unique in her ability to engage both children and adults in fun and enriching classes. And, we cherish the memories we have from our time with our kids in her classes. Our kids' enthusiasm can best be described in their hugs for her at the end of each class!" Mina, mom to K. & H.
"I have had the pleasure of taking music class for 2 1/2 years with Alexia Tate. One of my children started at 1 year the other at 6 weeks. She is caring, knowledgable and fun. Encouraging play and learning in a comfortable and joyful environment." Alissa, mom to N. & N.
"I highly recommend Alexia Tate as a music educator. 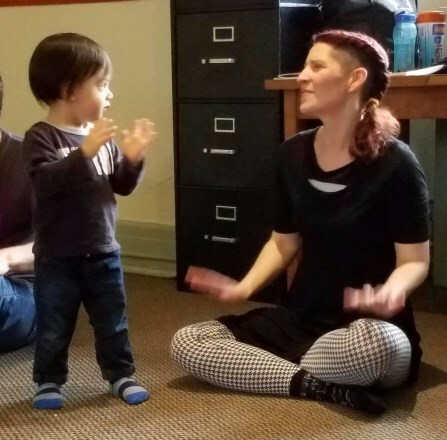 I met Alexia at a Music Together class for toddlers in Jackson Heights, NY. Right away, I was impressed by Alexia’s demeanor in classes. Alexia is a natural leader who exudes confidence and warmth toward her students. Although my son was not particularly attentive at this age, Alexia was patient and inclusive toward him. I appreciate this particularly because other teachers have overlooked my son for his inattention instead of encouraging him to participate in an activity. "Just as admirable as her personality is Alexia’s aptitude as a ukulele player and singer—her music is bright and inviting. My child responded very well to her musical style. Alexia also created many other enjoyable moments in class such as drumming, body movement, quiet time, or just jamming. Overall, Alexia creates a musical environment that is pleasant, well-managed, and ultimately conducive to learning. She encourages joy and individuality through music and I recommend her without reservation."